Independent contractor taxes include federal income tax, self-employment tax, state and municipal taxes. Independent contractors who are sole proprietors report taxes on Form 1040 and Schedule C. Taxes are due on April 15 or October 15, if filed on extension. Independent contractors are required to make estimated tax payments or with the tax return. This article is sponsored by Bench, a virtual bookkeeping service designed for independent contractors and self-employed individuals. Good bookkeeping is the key to keeping taxes as low as possible. Outsourcing those tasks to a professional can save independent contractors time and money. Bench’s bookkeeping services start at $95 per month, and you can start a free trial online in minutes. The types and amount of taxes independent contractors pay depend on the organizational structure of their trade or business. You can operate as a sole proprietor, which is the focus of this article, or as a limited liability company (LLC), partnership, S corporation, or C corporation. A sole proprietor, LLC, S-corp or partnership are all considered pass-through entities. This means that the income you make passes through to your personal tax return and calculated using your personal income tax rates. Independent contractors organized as sole proprietors pay federal income tax, self-employment tax, and state income taxes on their net earnings. Independent contractors pay their federal and state taxes throughout the year through estimated taxes. Self-employment income and related deductions are reported on Schedule C, which is filed along with the independent contractor’s Form 1040. Alternatively, independent contractors can organize their trade or business as an LLC, partnership, S-corp, or other business entity. This can sometimes lower the total amount of taxes as an independent contractor. LLCs with just one owner are taxed just the same as independent contractors. Partnerships, S-corps, and other business entities file separate tax returns, with the owners reporting and paying tax on their share of the net earnings and compensation on their personal Form 1040. Independent contractors pay federal, state, and local taxes. At the federal level, independent contractors pay federal income tax and the self-employment tax on their net earnings. Independent contractors also pay income tax in the state or states where they live and work. Some cities or counties charge business taxes, registration fees, or licenses. Because independent contractors need to pay taxes throughout the year, it’s always a good idea for independent contractors to estimate how much tax they will need to pay and to plan ahead so that the taxes are paid on time and in the right amount. Paying estimated taxes is a balancing act. Overestimating means reducing your working capital, but underestimating will leave you with a surprise bill at the end of the year. Independent contractors that use a bookkeeping service like Bench will ensure their estimated payments are accurate. Bench’s bookkeeping services start at $95 per month, and you can start with a free trial. Independent contractor tax rates at the federal and state level vary by income. The federal income tax rate starts at 10% and gradually increases to 37% based on a person’s filing status and taxable income after deductions. The self-employment tax has two rates of 15.3% and 2.9%. Other federal taxes are based on particular situations or income levels. State income tax rates are different in each state. Federal income tax rates for independent contractors start at 10% and increase gradually to 37% based on how much taxable income the independent contractor earns annually. Taxable income is the amount of total income left over after subtracting out deductions for which a person is eligible. Independent contractors operating as sole proprietors are considered pass-through entities. This means you will take your net income from your business and report it on your personal income Form 1040 tax return. Note: The tax rate in the first column applies to the range of taxable income based on the person’s filing status. The self-employment tax rate has two components. The first component is the 12.4% Social Security tax on net earnings up to a maximum limit, which is $132,900 for 2019. The second component is the 2.9% Medicare tax, which applies to all net earnings as an independent contractor. Thus, the self-employment tax rates are 15.3% on net earnings up to the Social Security limit, and 2.9% on net earnings above this limit. The Social Security tax applies only to the first $128,400 of for the year 2018. For 2019, Social Security tax applies to the first $132,900 of net earnings from self-employment. Medicare tax applies to the total net self-employment earnings, with no limit. There are other federal taxes that independent contractors sometimes need to pay, on top of the income tax and the self-employment tax. Some of these are based on actions a person takes, such as distributing funds from a tax-deferred retirement plan before reaching retirement age. Other federal taxes are triggered based on a person’s income level for the year, such as the alternative minimum tax. Independent contractor tax rates at a state level vary based on the state in which they reside. If the independent contractor’s office or business has a location in another state, the contractor might need to file and pay taxes in that other state as well. Each state sets its own income tax rates. New York, for example, has tax rates ranging from a low of 4% to a high of 8.82%. You can find tax rates in your state by visiting your state’s tax agency. As mentioned previously, you may be subject to additional independent contractor taxes. For example, sales tax if you sell products, excise taxes for the sale of certain items like alcohol and tobacco and other state and municipality taxes which will be determined by your geographical location. There are a variety of tax deductions independent contractors can take. A few of the top independent contractor tax deductions are home office expenses, computer and equipment purchases, health insurance, retirement savings, and other expenses related to their trade or business. Independent contractors who work from home can deduct part of their rent or mortgage, utilities, and other home-related expenses like repairs or property insurance. The amount of the home office deduction is based on the size of the office space as a percentage of the total square feet of the house. The office space must be regularly and exclusively used for business. Independent contractors can deduct health insurance premiums they pay for themselves, their spouse, and their dependents. The insurance could be set up as individual plans or as a group plan set up under the independent contractor’s business. The deduction includes premiums paid for medical insurance, dental insurance, and long-term care insurance. Independent contractors can make tax-deductible contributions to retirement plans. Besides traditional independent retirement accounts (IRAs) and Roth IRAs, independent contractors also can deduct up to $56,000 (for 2019) by setting money aside through a small business retirement plan like a simplified employee pension-IRA (SEP-IRA) or a solo 401(k). Independent contractors can deduct the cost of computers, software, machinery, equipment, desks, chairs, and furniture. These types of expenses are referred to as depreciation deductions. Independent contractors can choose between deducting costs over several years or all at once in the year the equipment or other asset starts being used for business purposes. Independent contractors can deduct costs related to driving their car, truck, or SUV for business. The tax-deductible portion is based on the number of miles the vehicle is driven for business compared to the total miles for the year. The purchase price is deducted as car depreciation. Independent contractors can also deduct gas, insurance, registration fees, and repairs. This is a brand new deduction for the year 2018. Independent contractors can take a deduction of up to 20% of their net earnings. The qualified business income deduction does not require spending money, unlike other deductions. Instead, the amount of the deduction varies based on the independent contractor’s income for the year and the nature of their trade or business. Independent contractors often hire other subcontractors to help them complete their projects. Amounts paid for contract labor are tax-deductible. Be aware that independent contractors may need to report on Form 1099 the amounts of at least $600 paid to other contractors. Independent contractors who operate retail stores, or who operate wholesale or manufacturing businesses, can deduct their inventory through the cost of goods sold deduction. Cost of goods sold represents the costs of making or purchasing inventory, and amounts are deducted in the year the inventory items are sold to customers. Independent contractors can deduct expenses that are directly related to conducting business. This can include expenses for liability insurance, telephone service, internet service, business cards, memberships in professional organizations, professional education courses, office supplies, reference books, and tools. Maximizing your tax deductions and, thereby, minimizing your tax bill, requires independent contractors to maintain accurate books all year round. However, bookkeeping can be an afterthought for many self-employed individuals ― you’re too busy growing your business. A bookkeeping service like Bench can make sure you have the information you need at tax season for as little as $95 per month. You can start with a free trial online in minutes. Filing taxes as an independent contractor can be summarized in four steps. First, add up all of your income and expenses for the year. Second, if you paid money to other independent contractors, you might need to complete Form 1099-MISC. Third, you’ll report your income and deductions on Schedule C which you will file with Form 1040. Lastly, calculate how much your tax might be for next year so you can make estimated tax payments throughout the year. You will need to know how much money you received as an independent contractor, and how much you spent on various tax-deductible expenses. We recommend you keep track of your income and expenses using accounting software or by hiring a bookkeeping service like Bench. The result is a detailed summary of your income and expenses for the year. If you hired other independent contractors to do work for you, you may need to send them a Form 1099-MISC. Form 1099 reporting is required if you paid an independent contractor at least at $600 during the year. Forms 1099 are due by January 31, so you need to be proactive about completing this task early in the year. Independent contractors organized as sole proprietors report their self-employment income and business-related deductions on Schedule C. This schedule is included with the contractor’s Form 1040. Other income is also reported on Form 1040, such as wages from employers. Contractors also file state tax returns based on where they reside or where they conducted business. After finishing their tax return for last year, independent contractors should estimate how much tax they will pay for the upcoming tax year. Independent contractors begin making estimated tax payments using Form 1040-ES for the upcoming tax year on April 15, the same day that taxes are due for the prior year. The key deadlines for filing taxes as a sole proprietor independent contractor are April 15 (first deadline) and October 15 (extended deadline). Additionally, the deadlines for paying quarterly independent contractor taxes for sole proprietors are April 15, June 15, September 15, and January 15. Taxes for S-corps and partnerships are due one month before your personal income tax return like March 15. This is because the income from these entities is passed through to you as an individual and must be reported on your personal tax return, Form 1040. Independent contractor quarterly taxes are due four times a year: April 15, June 15, and September 15, and January 15. While most independent contractors pay their estimated taxes quarterly, you can also send in estimated taxes more frequently such as monthly. Whenever the deadline for independent contractor quarterly taxes falls on a weekend or holiday, the due date moves to the next business day. April 15, 2019: for self-employment income earned from January to March. June 17, 2019: for income earned during April and May. September 16, 2019: for income earned from June to August. January 15, 2020: for income earned from September to December. The deadline to file Form 1040 (the personal tax return) is April 15, 2019, for the tax year 2018. If you need more time to file your tax return, the IRS will extend your filing deadline by six months to October 15. You need to request this extension by filing Form 4868 by the April 15 deadline. April 15 is also the deadline to pay any federal tax due for the year 2018. Partnerships, including LLCs taxed as partnerships, file their Form 1065 partnership return for the tax year 2018 by March 15, 2019. As mentioned previously, the income from the partnership must be reported on your personal tax return, Form 1040. Partnerships can request a six-month extension by filing Form 7004. As long as Form 7004 is filed with the IRS by March 15, the due date is extended to September 16, 2019. S-corporations, including LLCs taxed as S-corps, file their Form 1120S S-corp return for the year 2018 by March 15, 2019. S-corps can request a six-month extension by filing Form 7004. By doing so, the due date for the S-corp return is extended to September 16, 2019. The deadline is January 31, 2019, for independent contractors to file Form 1099-MISC to report amounts paid to contractors. Form 1099 reporting is required whenever independent contractors pay at least $600 during the course of the year to subcontractors, including attorneys, accountants, and freelancers. Independent contractors need to keep their finances well-organized for tax time. There are three tools you can implement to help you stay on top of your income and expenses: invest in accounting software, use a business expense tracker app to organize receipts, and use a mileage tracker app to track miles driven for business. If you plan to do your own books, you should invest in accounting software. Accounting software will allow you to track all of your income and expenses easily. Having all of this information in one place will make tax time a breeze. At the end of the year, you can give your tax professional access to your data, and they can run the reports they need to prepare and file your tax return. Keeping track of paper receipts has always been a challenge for most business owners. With today’s technology, you can get rid of paper receipts by downloading an app to your mobile device and taking a snapshot of your receipts instead. 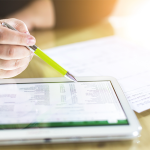 Business expense tracker apps allow you to organize receipts in a digital file easily and most of them will connect with your accounting software so that you don’t have to enter the information later on. If you use your personal vehicle for business, you should need to track the total miles driven for business to calculate your auto tax deduction. Mileage tracker apps are a great way to track miles driven to see clients and handle other business matters. It takes just a few minutes to download a mileage tracker app to your mobile device, and you can start tracking those miles immediately. By now, you should have a good idea of how taxes work as an independent contractor. We have discussed the general process for reporting income earned, deducting expenses, and paying taxes as an independent contractor. If you have a question, feel free to post your tax question in the Fit Small Business forum, and we will get an answer to you. Below we answer some of the more common questions about independent contractor taxes. If you don’t have the money to pay your taxes, you can apply for an installment agreement by completing Form 9465. The IRS must allow you to make installment payments if you don’t owe more than $25,000, prove that you can’t pay the taxes, and you can pay in full within three years. Are there penalties for paying taxes late as an independent contractor? The IRS charges penalties for paying taxes after the April 15 deadline. The penalties for not filing a tax return is 5% per month of the balance you owe, not to exceed 25% of the total tax due. If you file your tax return on time but do not pay the outstanding balance, the IRS will charge you a late payment penalty of 0.5% of the actual tax owed for each month that the tax remains unpaid from the due date, until the tax is paid in full. How much money should I set aside for taxes as an independent contractor? To determine how much to set aside for taxes, refer to last year’s federal and state tax returns, and adjust the amount based on your current earnings this year. Another option is to take your profit and loss statement, multiply the net profit by your personal income tax rate located on last year’s tax return. How much money do you need to make to file taxes as an independent contractor? If you earned at least $400 as an independent contractor, you are required to report that income on Schedule C and your personal Form 1040. If your total earnings as an independent contractor are less than $400, you still need to report that income, but you will not pay the self-employment tax on that income. Independent contractors pay federal and state tax on their net earnings, which is the income from a trade or business minus any related business deductions. Estimated taxes on this income are typically paid in advance four times a year. Independent contractors report their income and deductions on Form 1040 and Schedule C, and they may need to send Form 1099-MISC to subcontractors they hire. The key for independent contractors to avoid overpaying taxes is accurate bookkeeping. Most self-employed folks are too busy running their business to keep their books up to date and looking perfect. 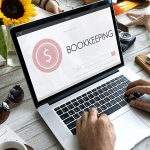 Outsourcing this task to a professional bookkeeping service like Bench will let you focus on what’s most important while ensuring your books will be ready for tax season. Bench’s bookkeeping services start at $95 per month, and they offer independent contractors a free trial.